The car body features shades of grey that segue from the bare steel covering the majority of the exterior to the distinctive Shark Skin rear end. Inside, the NewspaperWood finish borrows (literally) from the pages of major business dailies. The tailgate features an ingenious opening mechanism and provides easy access to the HYbrid-kick, an innovative electric scooter, stowed below the boot bottom. With the EXALT, PEUGEOT continues to build on the imposing vision of the sedan it first unveiled with the ONYX concept in 2012. A vision embodied by materials that achieve a blend of balance, local sourcing, recycling-based production and more.This new automotive experience is powered by a petrol HYbrid4 drive train with an output of 340hp. The EXALT is unabashedly radical, stripped of any superfluous materials to retain only what is really useful. All materials have been carefully selected with an eye to efficiency. PEUGEOT EXALT advances the approach initiated by the PEUGEOT ONYX concept in 2012. In a nod to the work carried out on the body of the vehicle, bare steel is used to accentuate the car’s expressive lines. Associated parts such as the wheels are also kept bare to highlight the markings left by the milling machines. As part of the campaign to ensure sourcing as close as possible to relevant markets, in China, the EXALT used ebony, chosen because of its plentiful growth in Asia; in Europe, this material has been replaced by “NewspaperWood “, which, as the name implies, is made from recycled newspapers. 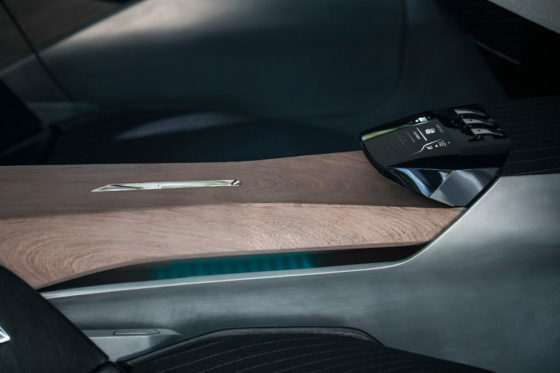 This new type of wood has evolved since its initial use on the ONYX concept. It is now obtained by recycling business papers, creating a distinctive salmon-pink hue.